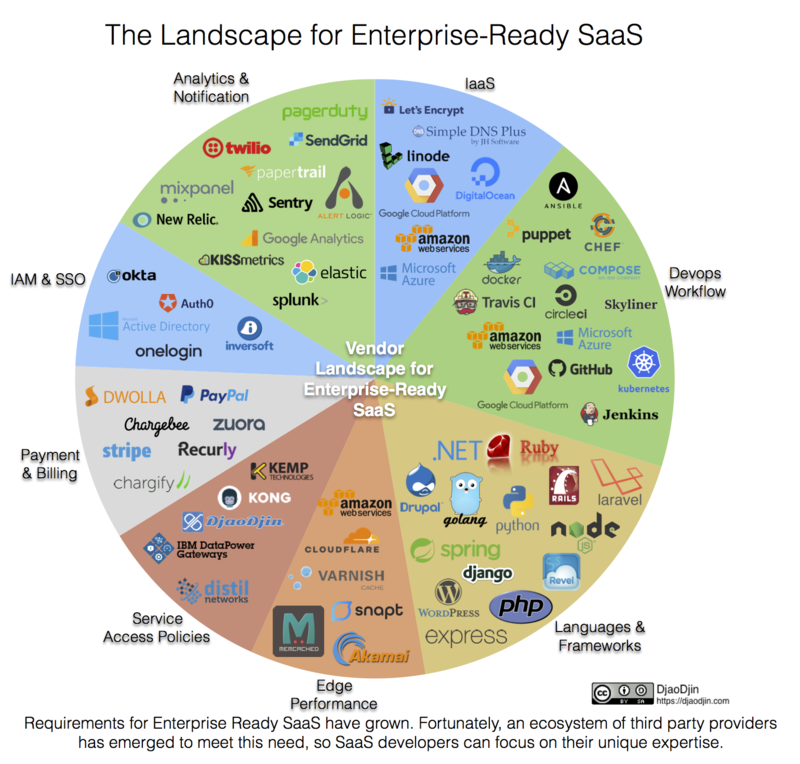 Enterprise-ready SaaS: The term suggest feature-rich, scalable, and secure -- qualities at the core of any cloud-based service for enterprise customers. But the bar is trending higher, and developers now have greater expectations to meet as they set their roadmap for enterprise-ready SaaS. So now you know what you need to build. But what about the SaaS developer who doesn't want to build the whole thing her/himself? If you’re making the tough buy/build calls to keep your development roadmap manageable and focused on those components where you and your team add unique value, fortunately there are third party solutions for the other pieces of the development puzzle. IaaS (Infrastructure as a Service): Physical infrastructure, servers, network gear, DNS. DevOps Workflow: Products to implement software lifecycle management, from continuous deployment (build bots, containers provisioning, etc.) to data retention policies and encryption key rotation. Languages & Frameworks: Application programming languages, libraries and frameworks, including CMS. Edge Performance: Web performance, including load balancing, caching, CDN, routing, and reverse proxy servers for performance tuning. Service Access Policies: Proxies and reverse-proxies to filter requests before they reach the micro-services business logic. This includes IP-based and web application firewalls, as well as A/B testing products, session managers, role-based access control (RBAC), and subscription-based access rules common across SaaS products. Payment & Billing: Processing transfers (credit card, ACH, etc. ), subscription and recurring billing, backlog and deferred accounting. IAM & SSO: Identity access management, single sign on and everything associated to user authentication. Analytics & Notification: Both marketing and operational analytics, including collection, aggregation, and reporting. Also, notification services (email, text, phone) -- these get triggered based on analytics reports so we lump them in this category. If you think we are missing obvious products and services, contact us ! We plan to update this landscape from time to time, to reflect significant corrections and important changes in the ecosystem.